Want to help someone at our organization? Donate to our general fund. 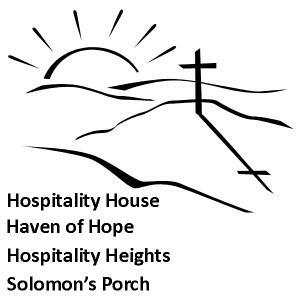 Hospitality Ministries is comprised of 4 ministries: - Hospitality House provides emergency shelter and transitional housing for homeless men, as well as hot showers, clothing, and meals to residents and non-residents. - Haven of Hope provides transitional housing and meals for homeless women and children. - Hospitality Heights provides transitional housing for homeless families in single-family manufactured homes. - Solomon's Porch is a teen drop-in center that serves dinner to at-risk youth Monday through Saturday. All of our programs are designed to share God's love in a supportive environment. All In the Spotlight Housing Veteran Family Employment Medical/Dental Technology Success! Sorry, we couldn't find any members matching your search. Not sure who to give to? Give to our organization's general fund and we'll distribute your gift to those at Hospitality Ministries with the most urgent needs.